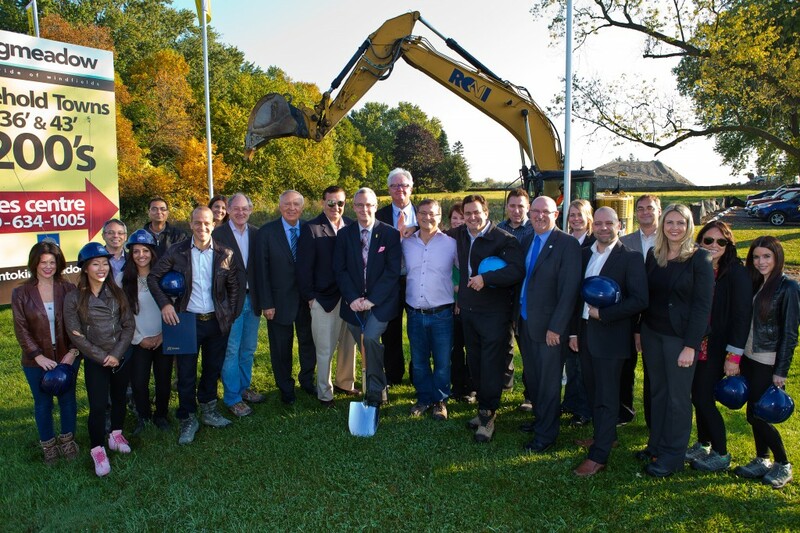 Construction has officially started at Kingmeadow in North Oshawa, and everyone from the Minto team was on site last week (with a hard hat in hand, of course) to mark the occasion. Oshawa Mayor John Henry also came out to celebrate and held the official Minto shovel, which has been at every groundbreaking event since 1986. How’s that for a dedicated builder? The glowing trees in the background of the above image are only a sample of the vibrant greenery that will soon encompass the homes. Kingmeadow will be located on 160 acres of farmland, promising pictorial views all year long. If you couldn’t make it out to the event, take a look at more groundbreaking pictures below! 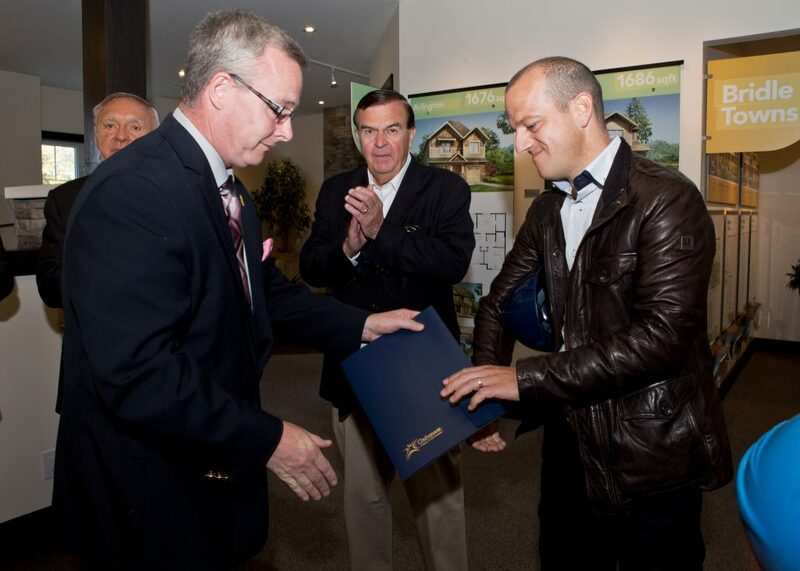 Left to right: Mayor John Henry, City Councillor John R. Aker, and Tom Giancos, VP of Minto Land Development. 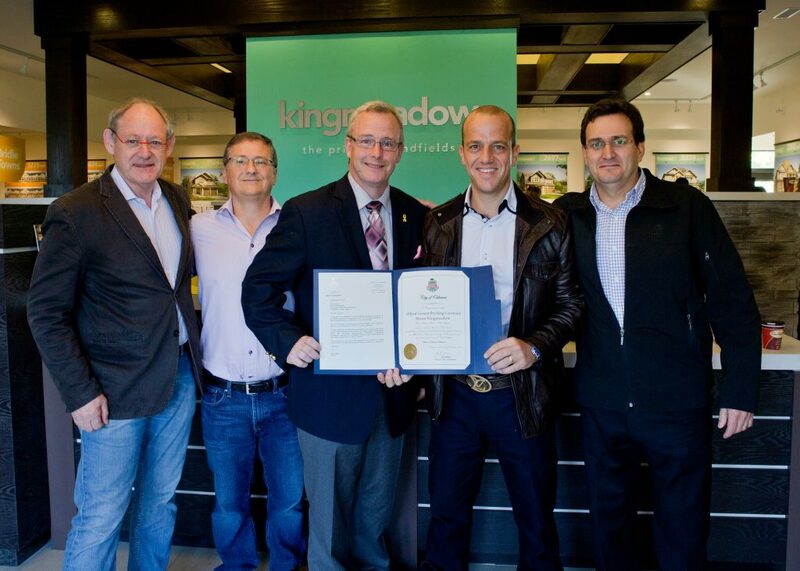 Left to right: Chris Sherriff-Scott, Senior Vice President of Urban Development; Daniel Belanger, Senior Vice President, GTA; John Henry, Mayor of Oshawa; Tom Giancos, VP of Land Development, Minto; Vince Santino, Vice President of Development. The single detached and townhome project is nestled in a family-oriented neighbourhood, nearby schools and new retail areas. It’s also conveniently located near both the 401 and 407. Prices for available townhouses start in the low $200,000s, and single-family homes start in the mid $300,000s.